It’s not uncommon for histories of the Reformation period to focus on everything but theology. There’s an interest in the sociopolitical issues, the global and cultural contexts of the movement, and the personal biographies of the key players. There is value, to be sure, in each of these detailed components, but often there is disinterest in or confusion about the theology of the Reformation. 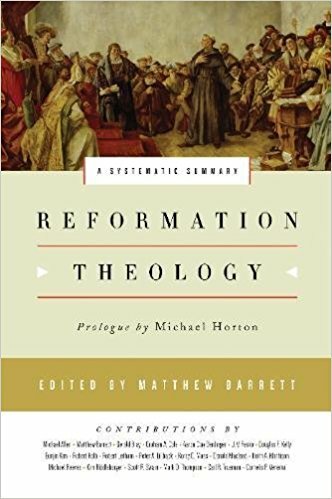 Matthew Barrett has pulled together an ace-team of historians and theologians to address the re-emphasis on Reformation theology. In Reformation Theology he provides one of the most comprehensive and systematic treatments of the development of theology during the period. There are, of course, plenty of volumes on theology and the Reformation. Timothy George’s famous and popular treatment of the Theology of the Reformers is frequently cited by scholars and laymen alike. But it is limited to just a handful of magisterial reformers and focuses on only one or two aspects of each individuals theology. Likewise, Paul Althaus’ much respected Theology of Martin Luther is indeed an expanded look at Luther’s theology, but it is focused solely one the one man and not a depiction of the whole movement. Other volumes attempt to highlight specific developments in preaching, or worship, or the sacraments, or focus on justification by faith alone. But there are few volumes this comprehensive and inclusive. The systematic approach is particularly helpful for this reads like a systematic theology, but with a very clear historical bent. The book’s first two parts set a context and relevance for the theology to be further developed. In Introduction Michael Horton makes a compelling case for the detailed study of Reformation theology, arguing that we have allowed doctrinal minimalism to cultivate a theological indifference. A deep study of the nuances of the faith is worthy of our time and energy. In Part 1 Gerald Bray, Carl Trueman, and Eunjin Kim set a historical context for the Reformation. Bray’s exploration of “Late-Medieval Theology” was especially insightful, and set a tremendous context for the latter discussions of Reformation theology. In part two various authors get into detailing the key doctrinal developments of the period. The remarkable benefit of this work is that it does not limit itself to one or two theologians of the time period. You certainly get plenty of talk on Luther and Calvin, but also some interesting interaction with Melancthon, Bullinger, and Vermigli (just to name a few). In addition the author’s highlight the specific contributions of the Reformers. This is not simply a systematic theology, it is a collection of historical essays centered around the Reformer’s own unique theological developments. So, Cornelius Venema doesn’t simply state the doctrine of predestination, he analyzes the distinct differences and discussions among Luther and later Lutheranism and Calvin and later Calvinism. It is a focused study of the subject within a specific time period. Seventeen chapters within part two take readers across the major doctrinal foci. The writing is dense at times, and interacts with both primary sources and scholarly discussions. Reformation Theology is very much a textbook kind of work, and yet it will be of immense value to readers. Not only will this serve to broaden the horizon of a reader’s historical understanding, but it will serve to instruct in doctrinal matters. There is much to learn from history and Barrett and his co-authors have done a tremendous job of highlighting specific lessons for the contemporary church. Reformation Theology is a wonderfully written collection of historical analysis, and yet it is more than simply historical analysis. It is good theology. I highly commend this fabulous volume as a great introduction to the theology of the Reformation.